Green Lantern and Wonder Woman. But World's Finest did have at least one series all its own, Lando, Man of Magic; and eventually, so did Comic Cavalcade. It started in the 15th issue (July, 1946). But this wasn't like most series in superhero comic books, in which a recurring protagonist repeatedly foils crime and/or evil. In the beginning, at least, there were no continuing characters at all. It was just a story. In fact, that was its name, "Just a Story". 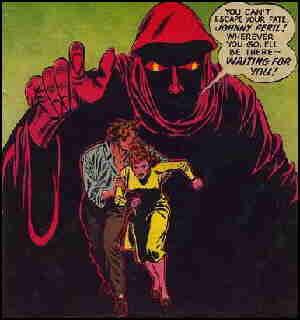 The stories were written and drawn by cartoonist Howard Purcell (Sargon the Sorcerer, The Gay Ghost). It was several issues before "Just a Story" sported a regular hero. Even then, that hero, Johnny Peril, tended to function more like The Spirit, who sometimes seemed like a supporting character in his own stories, a guy who happened to be on the scene while the actual story that the readers were interested in happened to other people. Johnny first appeared in #22 (September, 1947, still by Purcell), but even with him there, it remained just a story. Sometimes, he was only the narrator. As of #22, the title was changed to "Johnny Peril Tells Just a Story". Later, it became "Johnny Peril's Surprise Story". Not that Johnny was the sort of guy who didn't have adventures of his own. He was a two-fisted newspaper reporter, of the sort previously represented in comics by the likes of Jim Hardy and Hap Hopper. The stories owed less to them than to prose writers like O. Henry and radio shows like Inner Sanctum, but they eventually came around. By the time all the adventure characters were booted out of Comic Cavalcade in favor of Nutsy Squirrel, The Fox & the Crow etc., Johnny had pretty much morphed into an adventure hero in his own right. The last issue before the funny animals took over was #29 (November, 1948). Howard Purcell was still writing and drawing it. The switch in genres didn't have a crucial effect on the superheroes, who all came from somewhere else anyway. But Johnny was left without a venue, or would have been if DC (which by this time owned all the old All American characters) hadn't made a place for him a couple of months earlier by squeezing him into All Star Comics alongside The Justice Society of America. His first All Star appearance was in #42 (September, 1948). The first few episodes in All Star were by Purcell, but within a few years they were being done by Joe Kubert (Viking Prince, Sgt. Rock), Gil Kane (Blackmark, Morbius, the Living Vampire), Carmine Infantino (Adam Strange, Space Museum) and others. Again, Johnny ran in the back pages as long as the title kept its format (tho he skipped a couple of issues here and there). But after #57 (March, 1951) it switched to western stars like Strong Bow and The Trigger Twins, and Johnny was out again. He landed in Danger Trail #5 (April, 1951), where he replaced King Faraday, but that was the final issue. Next, Johnny was the beneficiary of a format change, instead of its victim. Sensation Comics dropped its ongoing characters, such as Wonder Woman and Astra, as of #106 (December, 1951) In #107, it added Johnny Peril (with just his name as the series title) as its only continuing character  the rest of the comic was filled with non-series fantasy/mystery stories. That format remained as the title was changed to Sensation Mystery with #109, except this time, Johnny appeared on the cover. Sensation Mystery ended wih #116 (August, 1953). Creators of these later stories included Alex Toth (Eclipso, Rex the Wonder Dog), Frank Giacoia (Knights of the Galaxy, Omega the Unknown) and more. A decade and a half later, DC was publishing new versions of The Flash, Green Lantern and more, and had several titles consisting mostly of non-series fantasy/mystery stories like Sensation had become. A decision was made to pull Johnny Peril out of mothballs. So Howard Purcell, who was still working for the company, was assigned to do a new story about him for The Unexpected #106 (May, 1968). He re-did the story from Comic Cavalcade #26, expanding it from 8 to 13 pages. But Purcell moved to Marvel to do The Black Knight, a new version of a '50s character, so the Johnny Peril revival was continued by writer George Kashdan (Mighty Hercules, Tommy Tomorrow) and artist Jack Sparling (Pirana, Naza, Stone-Age Warrior). The revival was brief. It lasted only until #114 (September, 1969), and this time, Johnny was finally gone for good. Text ©2010 Donald D. Markstein. Art © DC Comics.